As card-carrying champagne dollies, there’s little that revs us up like donning a showstopping dress and sipping something stiff. Even better? A cocktail inspired by couture, which is just what Revae Schneider’s got on tap. As the founder of Femme du Coupe — the local bar-styling company we’re totally intoxicated with — Schneider develops specialty cocktails for glitzy events and local hot spots like Homestead. 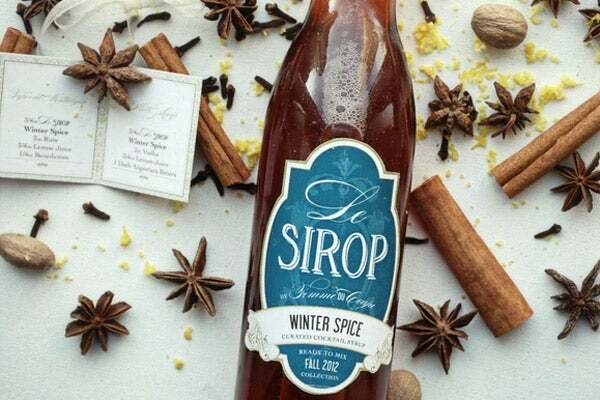 With her just-launched line of cocktail syrups, “Le Sirop by Femme de Coupe,” you can make like a mixologist at home. Available online for delivery or local pickup, the syrups come in seasonal flavors inspired by Schneider’s favorite runway collections. Stella McCartney’s fall pieces, full of botanical prints, influenced the floral Blueberry Lavender syrup while Alberta Ferretti’s pulse-quickening looks inspired the spicy Ginger Zest. And with its cozy, Christmas-y flavors, Winter Spice has the comforting appeal of a Ralph Lauren sweater. We can’t think of a classier way to get tipsy. Le Sirop by Femme de Coupe, $14.99, available at LeSirop.